Zurion® is a complete multiple vitamin and mineral formula with a complex combination of nutrients that work synergistically and are essential to the body’s needs. 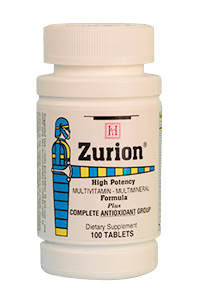 Zurion® contains antioxidants needed by the body’s immune system. These antioxidants can help to prevent the oxidation and degradation of cell membranes by free radicals. Free radicals are substances that are formed by exposure to toxins in our air, water and processed foods. When left unchecked, free radicals can damage cell structure via oxidation and can lead to serious illnesses. Zurion® provides a complement of B Vitamins, which are essential for healthy nerves, skin, hair, liver, and for the proper metabolism of carbohydrates, fats and proteins which help to provide the body with energy. Zurion® contains a variety of minerals for optimal health, including Iron, which is needed for oxygenation of red blood cells – and Calcium, vital for strong bones and teeth, for the proper transmission of nerve impulses, and to maintain a regular heartbeat. Zurion® contains Calcium, vital for the formation and maintenance of strong bones & teeth, for maintaining a regular heartbeat, and for the healthy transmission of nerve impulses. Calcium plays a role in cholesterol regulation and cardiovascular health. Zurion® contains Iron, a mineral found in all of our cells, which is used in the production of hemoglobin and the oxygenation of red blood cells. Adults and Children 12 and Over, take one (1) tablet daily. Not recommended for children under 12 years of age.